Explore this tasty Garlic-Glazed Beef Ribs Recipe. 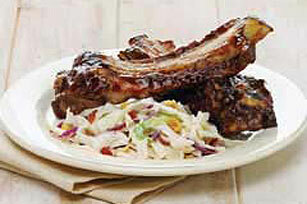 Baste beef ribs with garlic-flavored steak sauce and lemon juice in this Garlic-Glazed Beef Ribs Recipe. Preheat grill to medium heat. Mix steak sauce and lemon juice. Grill ribs 20 min. or until cooked through, turning and brushing occasionally with the steak sauce mixture. Balance this family favorite with a crisp green vegetable, such as broccoli and a glass of fat-free milk. Prepare as directed, using A.1. Original Sauce.